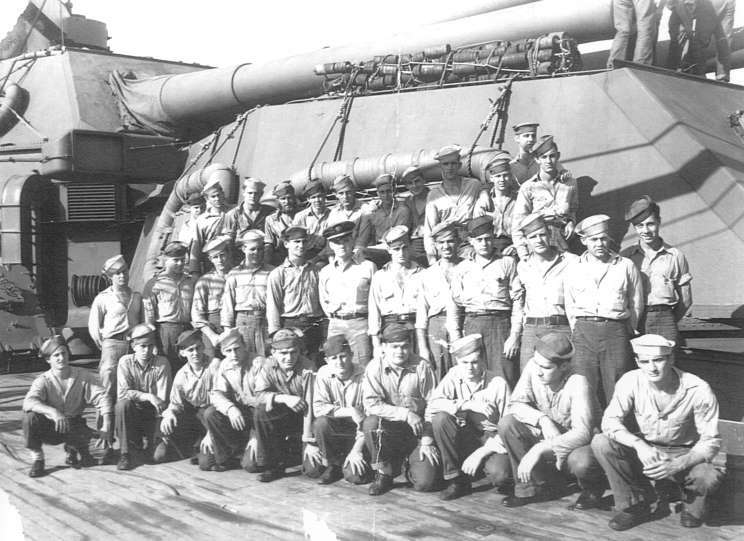 My dad, Henry "Hank" Koziatek, served on the USS Idaho, I believe that he is 4th from the right in the first row of the men seated in this photo (showing below). Do you know if the names of the sailors in this photo are listed anywhere? Any info is appreciated, and than you for all of your posts, photos and information. I am the grandson of John Carl Wynn who served on board the USS Idaho. I recently acquired some information that may be helpful for everyone. Thanks for keeping the men and memories alive! John Carl Wynn who served on the USS Idaho during WWII. Enlisted 1/13/42 as USNR for three years and placed on active duty immediately. Participated in the surrender of Japan in the Tokyo Bay area on 2 September 1945 on board the USS Idaho, a unit of the third fleet. Interviewed and does not desire to reenlist in the regular Navy. My father served on the USS Idaho (BB-42) from 1935-1937 as a MM2c. His service effects were lost during a move in the 1950's. Due to his service I've always had a special interest in Idaho and recently had the opportunity to acquire the bronze plaque shown below. It is 20" in diameter and weighs 45 lbs. Presumably it was mounted somewhere on board Idaho throughout its service life, but so far the effort to find someone who recalls it or has a photo taken on board Idaho which includes it have come to naught. Any information would be appreciated. My dad was a crew member on the Spud but the years and dates of his service are unknown. He was at 4th annual reunion in Norfolk, Va July 23,1961. I have that group picture of about 60 shipmates. Dad passed away in 1971. He was a Mustang Lt.JG James J. Vento. (Jimmy or JJ). I found this website while doing some research on one of the ships my husband's grandfather was stationed on. I have not had much luck finding information about his naval service, in my genealogy research, and other than talking about how much he loved flying, he did not talk much about the service at all. We do know that he served on the USS Idaho right after graduating from the Naval Academy, which would put him beginning his service on the Idaho around 1943/44. He would soon be transferred to the Rosie, if I remember right, around 1945. His name was Gordon Willis, from Roanoke, VA. Any information or photographs anyone may have would be very appreciated. Thank you so much! My father, Al Smith, was aboard the Idaho 1943/44. He went to a few Reunions prior to his passing in 1998. He had some great stories and I have a diary book that his shipmate Joseph L. Levicki put together and presented to him in 1995 and has some great short stories in it. My father was on USS Idaho, his name was Joseph Pascucci, he was of the "Pea Shooter" group. The photo below shows him at the top of the group by himself. Your website is great, its nice to honor all the servicemen who fought in World War II. My father passed away some years ago. I wish I had asked him many more questions. I am the youngest daughter of 2nd class seaman, Charles Albert Farmer. I am looking for anyone who may have known my father around 1942-43. He did not serve long based on military records. He was discharged for bad conduct, drunkenness and back then missed his ship and was AWOL. Listed him as a straggler. In old days that would be considered a deserter. I recently acquired my fathers military records and have discovered this skeleton in the closet. My father never told me about his Navy time. So was wondering if anyone out there alive knows of him and any stories to share would be greatly appreciated. My father passed away 1994, I wish I had taken the time to ask him more questions about his life and my grandparents. I recently stumbled upon your website while doing a bit of research on my grandfather's battleship and was delighted to see what I think is his smiling face in the large group photo of U.S.S. Idaho crewmen posted by Mike Swift. I can't be sure that it's him without being able to enlarge the photo, but I believe that my grandfather, Richard Thomas "Dickie" Doane, may be the 10th sailor from the right in the top row. I grew up listening to grandpa Dickie's stories of his time on board the Idaho, which he always said were the best time of his life. He passed away just this past month (May 1, 2009), and my grandmother, June Elizabeth Tompkins Doane, who was a WAVE in the U.S. Navy when she met my grandfather, passed away just one month later (May 31, 2009). I will miss them both immensely and always remember their heroic service to their country in time of war. I was sent the link to the MaritimeQuest website in regard to a post from a family member that served on the USS Idaho. I just wanted to let you know of www.ussidaho.com , a tribute site to the men who served on the USS Idaho. You may add a link to your site if you wish. My dad was on the Idaho in the 43-44’ time frame. I have an old picture I can scan (and repair) of his group. He was a boatswain’s mate, there are several sailors in the picture and may be of interest to someone. 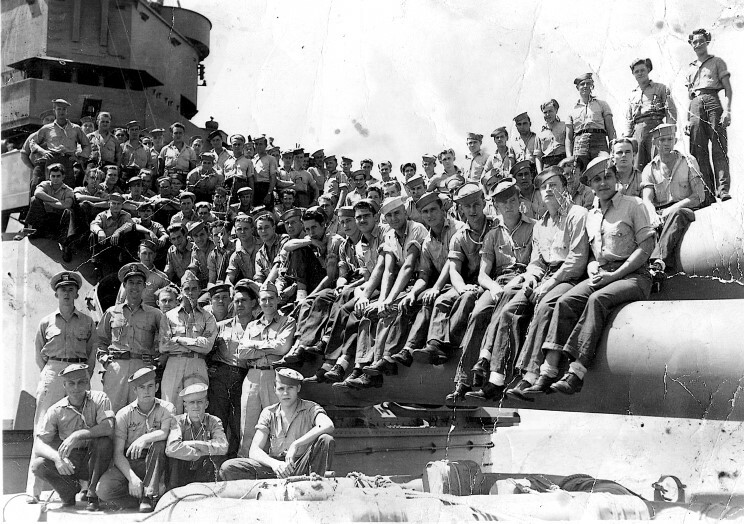 Crewmen on the USS Idaho BB-42 in 1943-1944. My father, Herbert H. Baker, served on the Idaho during WWII. While in the Navy, he reached the rank of Lieutenant JG. I believe that he worked with radar (a new thing back then) in the Navy. He died many years ago (1973) in my youth. Now, as I have grown older and more appreciated of history, I wish I could have asked him all about his service on the Idaho. I do recall him mentioning a Kamikaze attack that damaged the the bow of the ship. BTW, the Wikipedia write up on the BB42 is good reading.